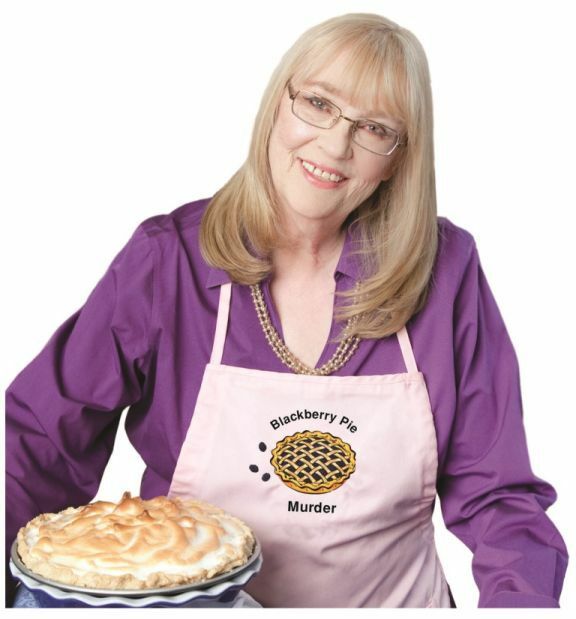 Joanne Fluke author of "Blackberry Pie Murder"
With a father who was an undertaker and an early hankering to bake, it’s no wonder that Joanne Fluke fits in nicely with my latest reading craze—culinary sleuths. 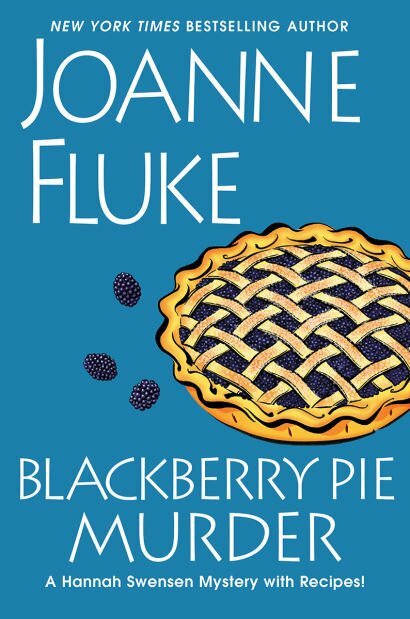 Fluke writes the Hannah Swensen Mystery with Recipe series and in her latest, "Blackberry Pie Murder" (Kensington Press 2014; $25), Hannah finds herself suspected of running over a man during a thunderstorm. But it soon turns out he was murdered by someone else and the biggest clue are the blackberry stains on his clothing. So now Hannah, who caters and owns a bakery and café in the tiny town of Lake Eden, Minn. needs to find not only someone who bakes blackberry pies but also has a penchant for murder. “Stressed is desserts spelled backwards, so eat dessert first!,” Fluke told me when we chatted on the phone about her latest book which features 22 recipes including Treasure Chest Cookies, Elsa’s Buttermilk Pie, Caramallow Bar Cookies and, naturally, Fresh Blackberry Pie. She’s a mystery writer so into baking that Fluke, author of "The Red Velvet Cake Murders" and "Carrot Cake Murders", creates many of her own recipes (which she tests at least three times) and has, so far, made more than 500,000 chocolate chip cookies for her readers. Fluke was one of the first of what now seems like many in the genre of culinary mystery writers. It came about she says because she always wanted to write a cookbook and so when her editor at Kensington asked if she’d like to write a cozy mystery series, she asked if she could include recipes and he said yes. Now, her books are so popular that readers host baking parties based upon her books. Mix the sugar, flour, cocoa and salt together in a medium-sized bowl. Drizzle the melted butter over the top of the bowl and mix it in with a fork. When the butter is incorporated, the mixture should resemble small beads. Spray a 9 inch by 13 inch cake pan with a nonstick cooking spray and dump the crust mixture in the bottom. Gently shake the pan to distribute evenly and then press it down a bit with a metal spatula. Sprinkle the chips evenly over the crust layer. Sprinkle the marshmallows over that. Sprinkle the flaked coconut on next and then sprinkle on the chopped nuts. Press it down again with the metal spatula. Pour the sweetened condensed milk evenly over the top. Bake the bars at 350 degrees. F. for 25 to 30 minutes, or until the bars are nicely browned. Preheat oven to 375˚ F rack in the middle position. Line your cookie sheets with parchment paper. Spray the parchment paper with nonstick cooking spray. Unwrap the squares of chocolate and break them apart. Put them in a small microwave-safe bowl. Melt them for 90 seconds on HIGH. Stir them until they're smooth and set them aside to cool while you mix up the cookie dough. Combine the butter, brown sugar, and sugar together in a large bowl. Beat them on medium speed until they're smooth. This should take less than a minute. Shut off the mixer and scrape down the bowl again. At low speed, mix in half of the flour. When the flour is incorporated, add the sour cream and mix it inches. Scrape down the bowl again and add the rest of the flour. Beat until the flour is fully incorporated. Use a teaspoon to spoon the dough onto the parchment-lined cookie sheets. If the dough is too sticky to work with, chill it for a half-hour or so and try again. Bake the cookies at 375 degrees F for 9 to 11 minutes, or until they rise and become firm. Slide the parchment from the cookie sheets and onto a wire rack. Let the cookies cool on the rack while the next batch is baking. When the next sheet of cookies is ready, pull the cooled cookies onto the counter or table and slide the parchment paper with the hot cookies onto the rack. Keep alternating until all the dough has been baked. When all the cookies are cool, peel them off the parchment paper and put them on waxed paper for frosting. Mix the softened butter with the softened cream cheese and the vanilla until the mixture is smooth. Make sure all ingredients are at room temperature. Add the powdered sugar in half-cup increments until the frosting is of proper spreading consistency. If you want to meet Fluke and have her sign a copy of her book, she’s in Chicago in March.